PORTOLA HILLS LIVING by Kelly Turbeville: 28366 Klondike - Major Price Reduction Make This Home all the Better! 28366 Klondike - Major Price Reduction Make This Home all the Better! 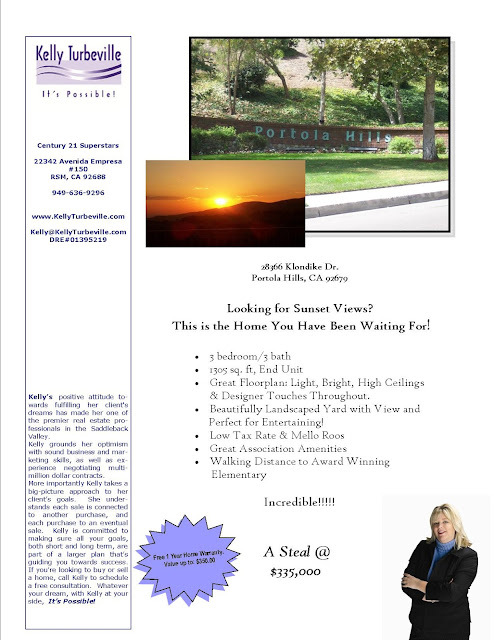 Ok have you been looking for a Townhome in lovely Lake Forest or the Saddleback Valley, then you want to check out our listing at 28366 Klondike Drive, in Portola Hills. This is a beauty but what makes it all the more special is the end unit is located at the end of the street with no one on one side and view all the way to the Pacific Ocean. You can't beat that.... But wait we just did, we reduced the price down to $335,000. Won't find anything better on the market, so hurry!